I am rebuilding a half finished project I imported from the States. The car was fully assembled running example prior to the USA owner having it stripped for panel and paint 5+ yrs ago. All the parts were supposed to be with the vehicle however a lot are missing. 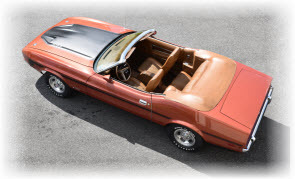 I have purchased a lot of new parts from CJ's, Stang-a-holics, Dallas Mustangs and Rock Auto but for the life of me cannot locate some items that do not appear to have been reproduced. Car is missing the underbody trans tunnel reinforcement plate. 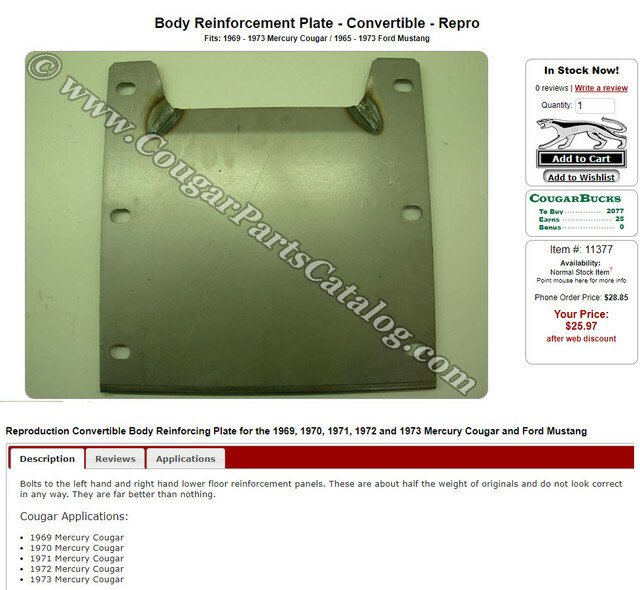 There is a mustang mercury website proclaiming to have an aftermarket plate for mercury/mustng (thinner than original) for 69-73 mustangs that looks identical to the 69-70 one sold by CJ's however when I emailed CJ's about the 71-73 they said they did not stock it and the 69-70 plate was different to the 71-73 so am a bit confused and reluctant to buy the one from the mercury site and freighting it to NZ to find it won't fit. Same for the C4 gearbox trans tunnel bracket. That is missing but cannot find a 71-73 bracket, plenty of reproduction 66-70 brackets on websites. Two of our members and site advertisers and supporters have used parts and a lot of knowledge, Don at Ohio Mustang Supply and Mike at Motorcity Mustang. Go to the classified section of the Forum to find them. Steve, understand your concern since your getting so may versions of fitment for that plate and shipping would be expensive to New Zealand. But that's why you wisely joined this Forum devoted to 71-73 Mustang's with a great group of members who go that "Extra Mile" to help others. Presently I am out of town for the 4th July week but I remember another Forum member having the same problem as you. The plate your referring to is what Ford called Plate, front floor lower cross member. This part (C5ZZ-7610962-A) regardless of what anyone tells you, was used on ALL 65-73 Mustang convertibles. The six retaining bolts are 3/8-16x 1-1/8 hex head bolt and washer. There may be some members here that have some used ones or you could also check with a couple of our on site vendors that have parts cars as Don C suggested. Don@ Ohio Mustang Supply or Mike @ Motorcity Mustang have come through many times for different members here. There is a repo version manufactured by Scott Drake but is not as thick as the original. You can also try your luck and search E-Bay with the Ford number. (06-30-2018, 01:05 PM)Hi Don C Wrote: Two of our members and site advertisers and supporters have used parts and a lot of knowledge, Don at Ohio Mustang Supply and Mike at Motorcity Mustang. Go to the classified section of the Forum to find them. (06-30-2018, 11:50 PM)Lsecluff Wrote: Steve, understand your concern since your getting so may versions of fitment for that plate and shipping would be expensive to New Zealand. But that's why you wisely joined this Forum devoted to 71-73 Mustang's with a great group of members who go that "Extra Mile" to help others.